Okay, this picture was taking a year or so ago–but it is a good illustration for what the world is looking like right about now. That is our outside cat, Pyewacket, framed by two trees in our woods. I bet he wishes he could come inside for some ma po. Two days ago, it was sunny and sixty degrees out. This morning, the forecast said that we would have some snow flurries and there might be a sprinkling of snow in grassy areas. 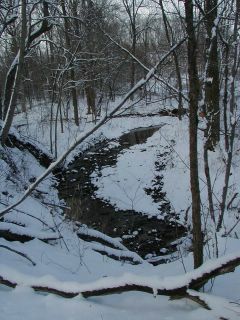 I just looked outside to see a totally white world with no visibility and at least an inch of snow coating the ground. An inch is not a sprinkling. I wanted to call the weather people up and suggest that they look outside before they update the website, but well, I think they live in a windowless bunker anyway, so it would do no good. Suffice to say, our world has gone from a muddy, damp place where spring was thinking about tip-toeing into the picture back into a winter wonderland in the space of about an hour. Winter reached out and took hold of our world again this morning; this makes me all the more glad that I cooked comfort food last night and am making some more tonight. Okay, so the folks at BA agree with Alice May Brock (You remember Alice–she has a restaurant) and myself that comfort food is meant to remind us of Mamma’s cooking, but they take it one step further–it is Mamma’s cooking done better. I note that the author does not have an Italian surname, which is healthy for him; the Italian Mammas I knew growing up would have taken a wooden spoon to the backside of any kid who suggested they could top her cooking, even if it was just meant to sound good in a magazine. Anyway, the text of the article opens with the question, “What in the world is comfort food?” Basically, the author’s notion is that comfort food is those dishes that evoke memories of good, safe happy times that make human beings feel wrapped up in a glowing blanket of love. That isn’t exactly what was said; that is a poetic paraphrase, but you get the idea. He also points out that comfort food is the perfect fit for the long, dull, cold days of February when all of us are so tired of winter that we just want to dive under a quilt and hibernate until April brings showers and May brings flowers. So, I guess that it is only natural that we are all ruminating on this comfort food idea right about now. 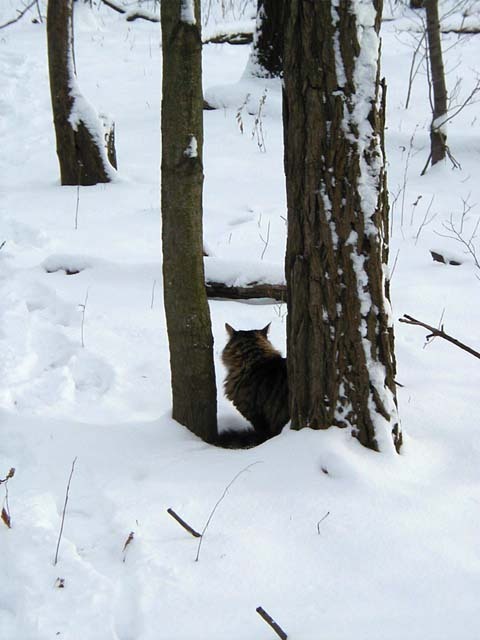 Winter is still here, the fickle sun had dashed back off to the tropics for the rest of her vacation and we are all still stuck here, hungry and cold and wanting love. Lacking warmth, we head to the kitchen to create some. Which is just what I did last night. I frolicked off to the kitchen, and cooked Zak and I up a nice mess of comfort food. The only thing is–I realized something was flawed in my theory of comfort food. When I said it is essentially, the foods we grew up with that remind us of Mamma’s kitchen and her arms around us, I wasn’t thinking to clearly about what comforts me. Because I have a whole list of comfort foods that I crave on blustery days that have diddly squat to do with my childhood background. No one fed me real Chinese food until I was in high school, and I didn’t taste Chinese home cooking until I was in my mid-twenties. So, if that is the case, why the heck did I crave Ma Po Tofu like it was a lifeline last night and had to make it even though it was nine-thirty in the p.m. before I was hungry? Before I answer that, let me tell you what Ma Po Tofu is, so you know what the heck I am talking about. From Sichuan province, Ma Po Tofu is essentially a hearty one dish meal of firm tofu braised in a spicy sauce with ground meat. I am told that traditionally, it is ground beef that is in the dish, though I wonder about that; beef is rarely used in China because cattle are beasts of burden. Pork tends to be the preferred red meat in most places in China, with lamb as the primary choice in areas with a heavy Muslim population, or in the extreme north, where Mongolian influence was strong. 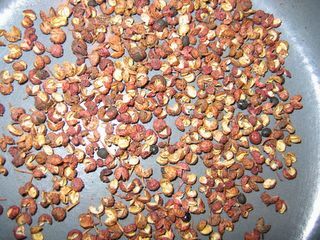 The main flavorings are Sichuan chili bean paste–a paste made from fermented soy and broad beans and chili peppers ground together, salted fermented black (soy) beans and Sichuan peppercorns, which are the seeds and seed cases of an ash tree that are dried and which impart a flowery, tingling peppery essence to any dish they are added to. I always buy them whole and toast them before grinding them up and adding them in generous amounts to my cooking. Sichuan peppercorns being toasted in the wee green Le Creuset pan. Anyway, the first time I ever tasted Ma Po was when I worked at Huy and Mei’s restaurant around fourteen years ago, when I was well out of childhood. I only had it once, but I loved it immediately and longed for its flavor until I learned to make it myself. No other restaurant I ever had it in satisfied me–I think it is was because they didn’t use the chili bean paste for the spiciness–lots of them used chili garlic paste which makes for a cleaner, less complex flavor and aroma. It is also less satisfying. 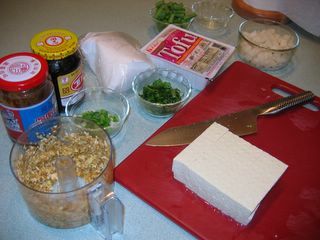 The ingredients for Ma Po Tofu. In the foreground is the cup to my mini food processor; inside it is minced garlic, fresh ginger and Sichuan preserved vegetable, which is a salty, spicy cabbage-like critter. Whatever it is, it is tasty. The stuff in the jar with the blue and red label is chili bean paste, and the jar with the yellow, red and white label contains salted, fermented black beans. Then, suddenly, the name made perfect sense to me. I still giggle about it. Anyway, that is why ma po tofu has such an odd name. Cut the tofu into about 1/2” cubes. Put into saucepan of simmering water, and turn heat down so the tofu simply steeps. This will help keep the tofu firm, and preheats it before it is added to the sauce. Soak the cloud ear in warm water until it rehydrates. Trim any woody parts, and then mince roughly. Heat oil in wok until smoking. Add garlic, ginger and preserved vegetable. Stir fry 30 seconds. Add pork. Stir and fry until the pork is dry and somewhat crunchy, breaking up large clumps as you go. Add cloud ear and water chestnuts. Add bean paste and fermented black beans, stir-fry a minute, until very fragrant. Add wine, and allow alcohol to boil off. Add chicken stock, sugar, thin soy sauce, bring to boil. Turn down heat. Drain tofu, and add to the sauce. Allow to simmer in sauce about two or three minutes to pick up the flavor of it. Stir gently, using the back of a ladle in order to not break up tofu cubes. If you stir vigorously, no matter how firm your tofu started out, it will crumble. Pour about 1/3 of cornstarch mixture into sauce. Stir. If it thickens to desired consistency, remove from heat. If you want it a bit thicker, add a little more. Do not just add it all at once! You may not need it all. You want it to just be a nice, moderately thick sauce, not a gel-like gluey consistency. As soon as it is the desired thickness, remove from heat. Add peppercorns, scallion tops and cilantro, and stir. Serve in bowls, with spoons, over rice or with the rice on the side, as you wish. Here is the finished Ma Po. No, green beans do not traditionally go in there; generally I make a batch of Sichuan style dry-fried green beans with minced pork to go with, but I only felt like making one dish with steamed rice last night. I wish you could smell it; a divine and delicious combination of aromas swirl from a well-made batch of ma po. So why is Ma Po Tofu a comfort food to me? Maybe because it reminds me of Mei and Huy and how good they were to me at a really hard time in my life. I worked there during my divorce, and in that time period, I felt very beset upon from all sides; very few in my family were being supportive to me and the custody battle was a long, horrible process. The folks at the restaurant took me in as family, and that place became a haven for me. I was treated with kindness and respect and love, something that was in short supply in my life right then. The foods of my childhood no longer filled me with joy, but sorrow, so it is no wonder that my psyche and tastebuds latched onto newer flavors as sources of comfort. I have since made peace with that time, and with my family, and so the hillbilly cooking that I grew up on no longer makes my throat close up with unshed tears, but brings me back to the kitchens of my grandmothers, aunts and mother in a positive way. But the foods I learned to eat in those cold years when I essentially learned to make my own family, still call to me, and I will cook and eat them when I want to remember that love is the greatest power that human beings wield in this world, and there is no act more sacred than sharing food and love with a lonely person who hungers. Fourteen years ago some people shared with me. And they saved my heart and soul by it. And so, now, I pass that love along to others in need. The world may buffet us with cold winds and blinding snow, and the sun may hide her face to us, but in our kitchens we can make our own warmth and give it to all who have need of it. I’ve been enjoying your old posts and this one is especially great. So I made this Ma Po Tofu tonight and it brought me some comfort though obviously not as much as you would get from making it for yourself. I didn’t have a couple of ingredients, though, including the preserved vegetable and chile bean paste. I didn’t try to substitute something for the preserved vegetable and I don’t think I’ve ever had that, so I don’t know what I’m missing. For the paste I used chile garlic paste with a little bit of added hoisin and a little bit of added char siu sauce. The latter was a mistake, I think. There’s a flavor in char siu sauce that I can’t put my finger on and it just isn’t right. But I was trying to find a combination that would be both hot and bean-y. Ah well. I’ll get it right next time. The trick with the simmering tofu is one that never would have occurred to me and it worked well. Oh, I love tofu. I am glad that you liked the recipe. Both char siu and hoisin sauce are very sweet–compared to the Sichuan broad bean paste, especially. It is fermented and very salty–with a nearly bitter, smoky quality. It is not too hard to find in Asian markets, if you have a good one near by. The chile garlic paste would work quite well for the heat, though. Glad you are having fun reading my archives. Someday soon the pictures will reappear here, we hope. Hi, I totally understand where you are coming from! I made ma po tofu on Friday night and it is all I can think about now. It was amazing! So hot and spicy, but so perfectly balanced that there was no after-burn. My recipe is a bit different from yours, but I’m sure both are great! All I want to do now is go on a mission at eat it at all different restaurants and compare them! I read your recipe, and it isn’t that different from mine; it sounded good to me. 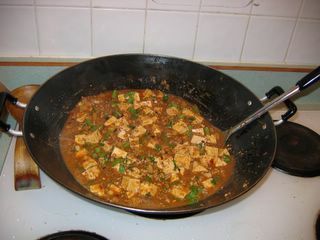 I found this old post when I was making ma po tofu the other night; I was using Fuchsia Dunlop’s recipe from Land of Plenty, but wondered if you had any suggestions for making a vegetarian version. (I did end up using cloud ears instead of the meat, which worked very well). I can’t help but notice that in this version you apparently abandon the cloud ears after rehydrating and mincing them, and never use the water chestnuts at all — do you actually use either of these ingredients, and what do you do with them? 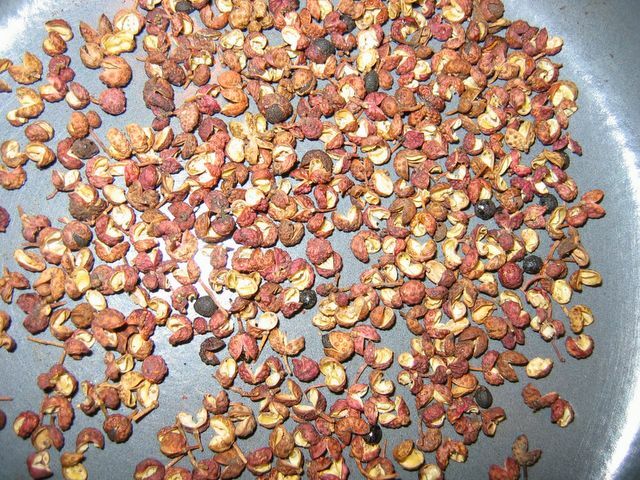 Any advice for a particular brand of chili bean paste? I don’t think mine is Sichuan, and it’s not very hot. Andrea–first of all, thank you for pointing out my editorial error. I fixed it–the water chestnuts and cloud ears go in after the pork is cooked. For a vegetarian version, I would use rehydrated dried shiitake mushrooms, stems removed and discarded, water squeezed out and saved to use in the sauce, and caps diced. To these, I would add 8 ounces of fresh button mushrooms, minced finely–as if I were making duxelle. These, I would saute as I cooked the meat–in place of the meat. This will give a great textural contrast with the tofu and will taste awesome! The brand that I favor comes from Taiwan and is made by the Ming Teh Food Industry Company. It has a yellow, red and blue label with a globe on it and very little English lettering. I am glad you are enjoying the archives–check out the category titled “The Chinese Pantry,” where you can get my recommendations for brands of various ingredients.